In a relationship that's older than recorded history, our canine companions have been instrumental in shaping humanity's concepts of loyalty and love. Though perhaps the greatest gift dogs have to offer us is not merely their company as cherished pets, but rather a lesson on love as kind-hearted ambassadors from the animal kingdom. While we've come to think of dogs as members of our families, distinct from all other types of creatures, these pets prove much less discriminating in how they regard animals unlike themselves -- an example we'd be wise to follow. "I have myself seen a dog, who never passed a cat who lay sick in a basket, and was a great friend of his, without giving her a few licks with his tongue, the surest sign of kind feeling in a dog." The purest examples of altruism in dogs can be seen in the countless cases of inter-species adoption. One needn't look too long to find stories of dogs accepting orphaned kittens, ducks, squirrels, deer, and even tigers, to name a few, into the warm circle of their affection. Interestingly, the strong maternal instincts of dogs played a major role in the development of human civilization, at least in myth. According to the legend surrounding the origins of Rome, the city's fabled founders Romulus and Remus survived by suckling from a she-wolf -- an allegory, perhaps, for how our canine's compassionate presence was critical to the success of our species. Although dogs' gentle temperament no doubt reflects the hand of humans in early days of selective breeding, an openness of affection towards other animals, particularly the young and helpless, is deep-seated in their nature. "Instinctively animals take care of young to help them survive and therefore pass on the family DNA. So I think there's some hard wiring in there that leads them to offer care to another animal in need. 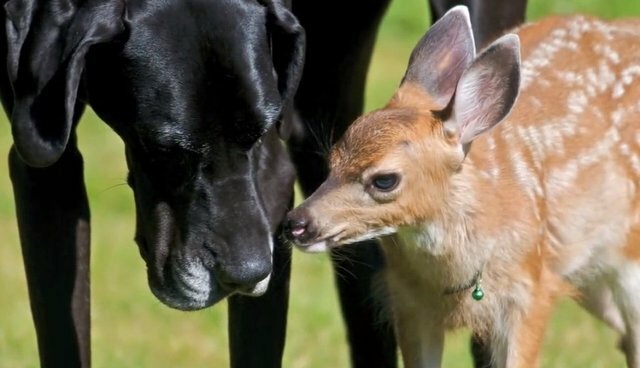 If it isn't a relative, there maybe some wires crossed, but I think the behavior comes from the same place," says Jenny Holland, author of the book Unlikely Friendships. "Mammals have the same brain structures, the same system, related to emotion that we have, so why not? Sometimes we don't give them as much credit as they deserve for being complex, thinking, empathetic beings." Despite having shared an ancient history of companionship with people that today is as strong as ever, dogs and humans diverged in attitudes towards other animals at a crucial point in our mutual development. According to Psychology Today writer Steven Kotler, "until the advent of agriculture, humans did not view themselves as a superior species." This pivot may have led to a weakening our natural empathy for other animals, now seen as lesser beings. On the other hand, dogs never developed this lofty air of superiority, allowing deep interspecies bonds to come more easily. And while it's certainly true that humans still possess strong feeling of empathy and exhibit altruistic behavior towards other animals, our underlying relationship with the non-humans among us still remains that of ownership and dominance. Perhaps by taking a cue from our canine companions' generous spirits of compassion, we can forge a more rewarding relationship with animals around us, seeing them not as strangers, but more as friends of a friend -- and man's best one at that.